Today it’s time for another curious phenomena that occurs in the USA. Death Valley is a desert valley located in California (USA). It is situated within the Mojave Desert and this is one of the hottest places of the world. Death Valley is a flat desert where there are stones. 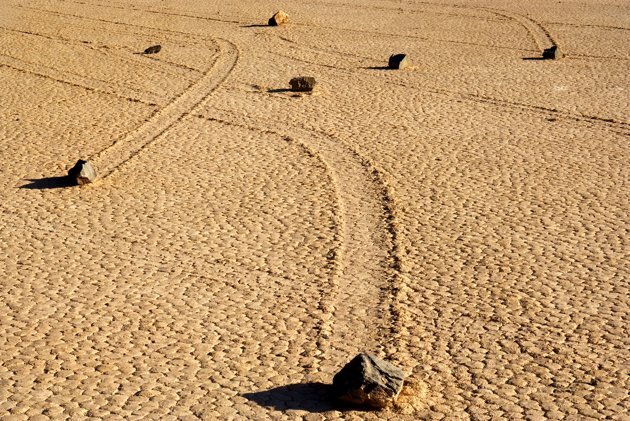 Inexplicably the stones move hundreds of meters across the desert with different trajectories. The stones weigh sometines more than ten kilos. How are these stones able to move so many meters? Some people think that the wind is the causer of this, but scientifics have made researchs finding that the wind is completly unable to move the stones so many meters. A recent theory is that a layer of ice is created under the stone and this layer make the stone move very easily with a simple breeze. Will this be true? Here are some photos of the sailing stones.